Pace of Play in Junior Golf is a big problem. Here's how speed up play. One of the biggest drawbacks in participating in junior golf tournaments is that a round can often take a very long time. Our kids have played tournament rounds that have endured 3 hours for 9 holes and 6 hours for 18 hole events. Over the years US Kids Golf has recognized the problem and actively tries to implement Pace of Play policies in junior golf tournaments to ensure play is completed in a timely manner. Overly long rounds put players off junior golf tours and it can negatively impact revenue for the organizers. In regional and international US Kids Golf events the players pass through 'pace of play checkpoints' and get to either keep their green cards (all players starts with one), or trade it in for a red card, depending on their time and positioning relative to group in front of them. In local US Kids Golf tournaments time needs to be self-recorded on the players' scorecards at the end of holes 4, 9, 13 and 18. A group is considered to be in position (keeping their green card) if they are within the time printed on their score cards or complete play (measured as the flag being placed back in the hole), within 14 minutes of the group in front of them. On the final hole the group is required to finish within 19 minutes of the group ahead of them. In order to be penalized for pace of play (one stroke penalty for each member of the group) the group would need to be behind time (as indicated on the scorecard) and out of position. So how can we, as parents of junior golfers, help keep the pace of play in junior tournaments ticking over smoothly? On our local tour, US Kids Golf has started flying the following banner at the first tee. If you are behind the required pace of play and need to speed up play, 'ready golf' is an option whereby each golfer proceeds with his/her shot when ready, regardless of whether he/she is 'away' or has the 'honors'. Golf etiquette dictates that the player who is 'away' (furthest from the hole) usually hits first; and on the tee the player with 'honors' (best score on last hole) tees off first. If you decide within the group to play 'ready golf' all members must agree to it. 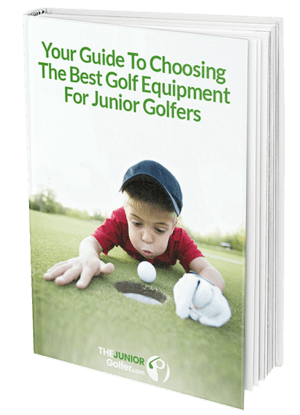 Etiquette for Junior Golfers contains more etiquette pointers that will help make the round more enjoyable. Note that playing ready golf is applicable for stroke play tournaments (almost all junior tournaments are stroke play). However, in match play tournaments ready golf does not apply as the play order needs to be strictly followed. Note that even if juniors are not playing ready golf, in order to keep up pace of play they should be preparing to play their next shot and "be ready" to play immediately when it is their turn. We see many juniors only starting to prepare for their shots when it is their turn. By that time they should have already got their distance, assessed the wind, decided on a club, read the green/break etc. Interestingly, the European golf tried out a shot clock in 2018 with mixed results. Although we will likely never see a shot clock introduced in junior golf, as a general rule players should strive to take less than 30 seconds per shot. What is one thing that made you enjoy playing with your playing partners? Connor: They confirmed scores after each hole which helps. Rob: They were friendly and talkative. Connor is older, quiet and focused by nature and not given to chit-chat on the golf course but he appreciated that his playing partners confirmed scores after each hole. This is Team Work and it speeds up play by not having to discuss scores sometime later during the round. If a player hits a ball into the woods and can't find it they have 3 minutes to look for it (under the old rules a player had 5 minutes to search for a ball). Playing partners are under no obligation to help search for lost balls, but if they do it is helpful. A good rule is for other players to play their ball first then help look. It's Team Work - and it makes the Dream Work! For non-caddie tournaments (e.g. junior tournaments for ages 12 and up such as State PGA, Hurricanes, AJGA, Optimist etc. ), the general rule is for spectators to keep a 10-15 yard distance from the players unless providing food, sunscreen etc. The one exception is to help speed up play by fore caddying and helping to locate balls in deep rough or hazards. Even in tournaments that allow caddies, it is often a good idea for one caddie to go ahead to forecaddie on holes that have blind rises or other hazards that easily lead to lost balls. Sometimes the ball lands in a tricky spot and there might be confusion as to how to proceed. In this case, the Rules allow a player to complete the hole, without penalty, with two balls. Let playing partners know you are playing 2 balls. Declare which ball you want to count if the rules permit. Play out the hole with both balls, recording separate scores. Report the situation to the scorer before turning the scorecard in. Playing two balls can significantly speed up pace of play rather than waiting 10 or more minutes for a rules official to arrive. If you think you may have hit your ball OB (out of bounds) or the ball may be lost (but not in a water hazard), before you go and look, hit a provisional ball just in case. This will ensure you don't have to walk back to the tee / site of the wayward swing and significantly impact your group's pace of play. Remember provisional balls must be identified and declared before playing them. Note - the new (2019) rules allow a tournament committee to permit a drop from the edge of the fairway closest to where the ball went OB with a 2 stroke penalty. This is designed to save time in that a golfer does not have to return to the tee or the place of the last shot. You will notice that "Please Do Not Over-Coach" is listed a whopping 3 times in the US Kids Golf Pace of Play guidelines. It is a problem endemic in junior golf and probably stems from the current parental crisis where daddy-caddies and moms-on-the-bag are caught in a riptide of super-competitive parenting and a race to create mini-superstars and have them committed to D1 colleges before they are fully-fledged teenagers. When I first started caddying for my younger junior we butted heads constantly. He is obstinate, independent and probably resented that dad was with older brother and he had to have the less experienced, mom, on the bag. During our first US Kids Golf State tournament (and only our 10th tournament ever) my husband mercifully took over from me on hole 14. It had been a long day - my boy had been particularly scathing and his playing partner's daddy caddie ....... oh let me tell you about him! So, hole 14 and my husband takes over as caddy. My kid says: "Mom, I love you, but you're a terrible caddy." Me: "You have no choice most of the time and besides, you know what to do and you pretty much caddy for yourself anyway." Him: "Exactly, so just keep quiet." The daddy caddy looks at me like - are you going to do anything about your child's attitude? "Not our best, maybe daddy had you lined up a bit wrong." "Little more to the right. No stop. Restart. Bring your foot slightly right, now left, no too much... OK trust your alignment and accelerate through with the club. Ready. Go." "That’s the first shot you have pulled, Son. Slow down, focus and accelerate. Finish through." "Put your club face here. Don’t touch the ball. Let’s make sure it’s straight". "We’ve got to open the club face slightly on this shot. No, son. Step back. Let’s look at it again." "Make sure your body and club make up railway tracks." "Check your alignment again, I think you moved son. Don’t move your feet. Set them in my direction and pump." In another regional tournament, this time at Pinehurst, we played with a Daddy Caddy who raced from hole to hole like a Marine hitting Omaha Beach then spent long painstaking minutes physically positioning and verbally instructing line, angle and read on Every Single Shot! Well, maybe that "shot clock" is not such a bad idea. Here are some tips for being a good caddie (i.e. in addition to not over coaching). The USKids positive coaching alliance program is a great program for caddies that are new to junior golf. The new (2019) rules include a provision that expressly prohibits a caddie from lining up a player: the caddie is not allowed to stand on/close to extended line of play while player is taking stance. Hopefully this will be enforced in junior tournaments! Sprinting from green to tee box is not the answer to Pace of Play in junior golf woes. The US Kids Golf guidelines mentioned above offer practical methods of avoiding a red card, or at least undue stress, in a junior golf tournament. Small practical things like walking briskly between shots and positioning your bag between the green and the next tee will save far more time than you think. In a recent tournament the starting official provided a nice analogy to the youngsters on the first tee, telling them that they are the train locomotive and they have to keep all the train cars behind them on time, if they slow down or don't keep up to the group in front then the whole train slows down. In my experience I don't think that 'over-coaching' is going away any time soon but parents would do well to know that over coaching can be significantly detrimental to our young players and they are also not too far away from having to do it all on their own. By all means give them a suggestion here and there, but the quicker they learn to figure it out for themselves the better it will be for everyone.